What is the Connection Between Obesity and Diabetes? HomeDiabetes Obesity What is the Connection Between Obesity and Diabetes? The rates of diabetes have risen in the past few decades. So have obesity rates. Are the two connected? Scientists think so. More than one-third of people in the United States have obesity, according to the Centers for Disease Control and Prevention (CDC). Almost a third of people living in the U.S. have diabetes, according to the American Diabetes Association. The connection between obesity and diabetes is undeniable. About 30 percent of overweight people have diabetes, according to the Harvard Gazette, and 85 percent of people with diabetes are overweight. The number of obese people has increased dramatically in the past few decades. In 1990, obese people made up only 15 percent of the population in most U.S. states, according to Harvard School of Public Health. Just 20 years later, 36 states reported obesity of 25 percent and higher; 12 of those states reported obesity rates of 30 percent or greater. Today, 36.5 percent of all adults in the U.S. are obese. The number of people with diabetes has also risen sharply over the same timeframe. In 1990, about 2.52 percent of the U.S. population had diabetes, according to the CDC. By 2015, the percentage of people with diabetes rose to 7.40. The connection is more than just coincidental – science shows the connection between diabetes and obesity. Human body cells use sugar, also known as glucose, as energy. Muscle tissue pulls glucose from the blood. Insulin, a type of hormone, “unlocks” the cells so that the muscles can absorb the sugar. The human body usually produces all the insulin it needs in the pancreas, which is a large gland that sits behind the stomach. When a person eats, the body breaks the food down into its basic components then sends those components to different parts of the body through the bloodstream. After eating, the levels of sugar in the bloodstream rise. The pancreas senses this rise in blood sugar levels and, in response, releases insulin. Diabetes is a condition where the cells cannot absorb sugar from the bloodstream. The unused sugar continues to circulate in the bloodstream. This causes levels of glucose to rise in the bloodstream, a condition known as high blood sugar or hyperglycemia. There are two types of diabetes. In type 1 diabetes, the pancreas does not make enough insulin to unlock muscle cells so they can absorb sugar. In type 2 diabetes, the body does not use the insulin properly. Medical professionals refer to this as insulin resistance. Medical researchers are still working to determine the underlying cause of type 2 diabetes. 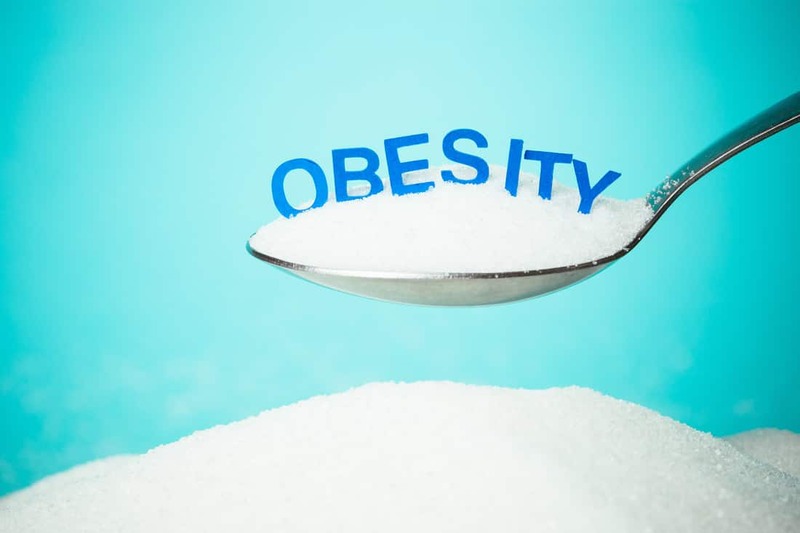 Most of the research shows a strong connection between obesity and diabetes, although being obese does not mean a person will automatically develop diabetes. Each of these risk factors for diabetes is associated with being overweight or obese. In other words, being overweight or obese can increase blood pressure, and cause unhealthy shifts in cholesterol and triglycerides to raise the risk of diabetes. Losing weight and improving your blood pressure, cholesterol and triglycerides, then, can reduce the risk of diabetes. Being obese is at least partly responsible for the development of type 2 diabetes. Obesity is a condition associated with excess body fat. The CDC associates the rise of type 2 diabetes rates with the increase in obesity rates, less participation in sports, and aging. Medical professionals define obesity as a body mass index (BMI) greater than 30. Doctors commonly recommend weight loss to avoid and treat type 2 diabetes. Losing weight helps the body become less insulin resistant so the body can use insulin correctly to reduce blood sugar levels. Losing weight in a weight loss program can help people lose the weight they need to lower their risk of diabetes. A weight loss program helps individuals lose the maximum amount of weight in the shortest amount of time, safely and effectively. The most important thing a person can do is to start a weight loss program immediately. Consulting with a weight loss doctor can help an individual develop a healthy eating plan, increase physical activity, and set realistic goals that help someone lose weight and avoid diabetes.